As a pizza-geek living in Los Angeles for the past few years, I’ve been pretty disappointed with the pies that are available to me and the other 4 million hungry people in this city. 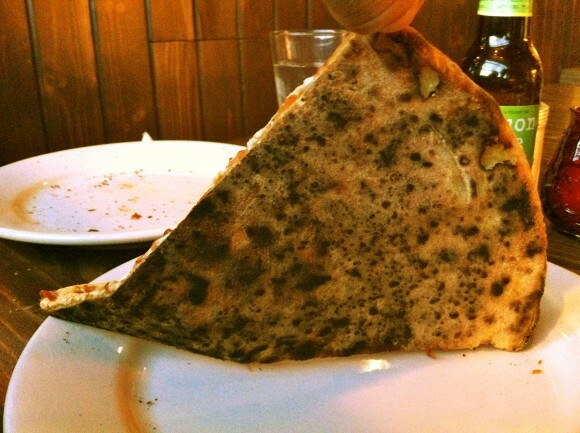 Even the buzziest pizza places with the best reviews tend to be bland and generic (I do like Mozza, though). So a few nights ago, when I got an email about a new joint called Pizzanista! in downtown LA, I didn’t pay much attention–until I noticed that they serve vegan slices, and offer them for $2 on Tuesdays along with regular cheese and pepperoni. I haven’t been able to have pizza slices since starting my vegan experiment almost four years ago, and suddenly my mouth was watering for something triangular and delicious. Pizzanista! is in the downtown LA arts district, near the warehouses and Greyhound station, and across from American Apparel’s factory. Driving in on the sideroads from north of downtown brings you through the train yards, junk yards, and rock quarries, gritty stuff that always seems to inspire me to build stuff, or just take photos (note to myself: bring camera next time). Just west of the LA river, the pizzeria occupies the front of a brick building with a fantastic bar arrangement that straddles inside and out via a large flip-open window. Conveniently located in the back of the building is Tony’s, a divey bar popular with the hip crowd. The inside of Pizzanista! felt clean and warm, with dark wood tabletops accenting the brickwork. 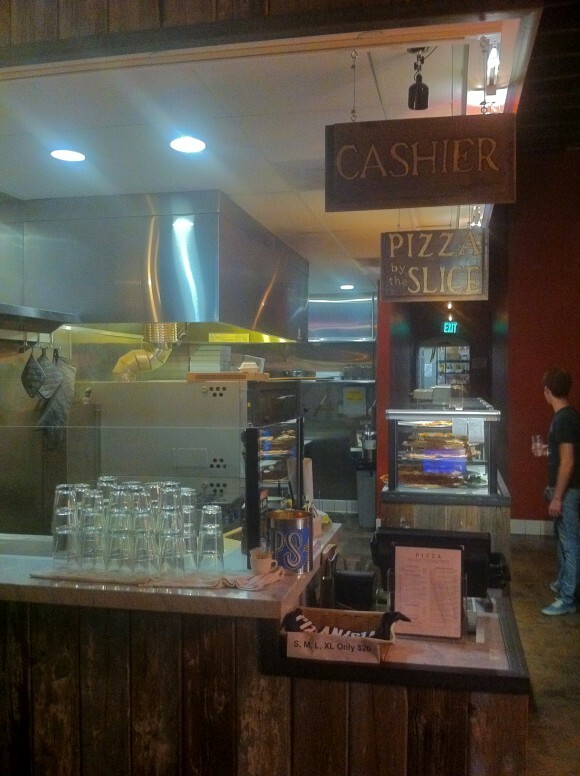 About halfway to the back, the kitchen, register, and a display of pizzas framed the main action of the restaurant. Proudly running the joint (and manning the register during my visit) is Salman Agah, former Thrasher magazine Skater of the Year, and a very nice fellow. 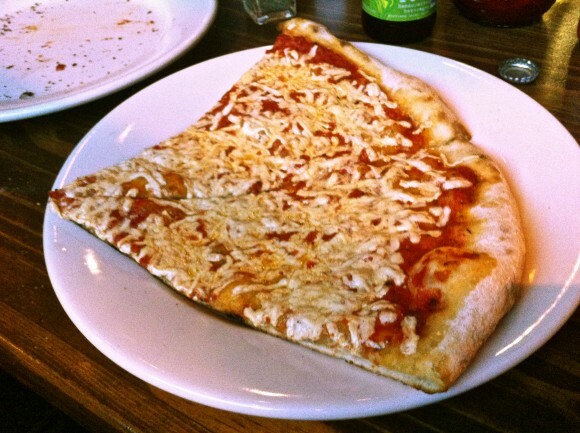 For their $2 Tuesday vegan slices, the joint serves a piece of nicely-sized Daiya and sauce pizza. On the other days of the week, Salman told me they typically have at least one vegan pie you can buy slices from, usually tomato and spinach (I think those ones are $3 each, but best to check). It took a few minutes to warm the pizza up and when it came to our table, I was immediately in heaven. The crust was amazing–perfect amount of toasty crunch underneath, chewy rim, and plenty flavorful. The sauce was so tangy and rich that I immediately forgot that I usually ask for extra on the side (I love sauce). And although I’m normally not a fan of Daiya — I think cheeseless pizza is better, this time it worked, and well. Yes, for the first time in almost four years, I was eating pizza slices. And I was in heaven. 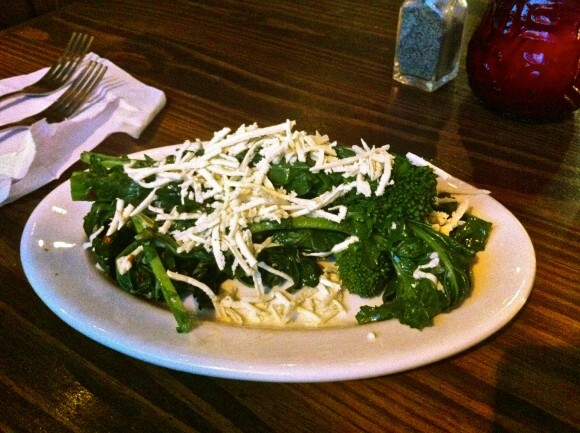 We ordered another round of slices, and some broccoli rabe. We listened to the perfectly set 80’s music. We sat in a pizza coma and read our books. And we’ll be back. 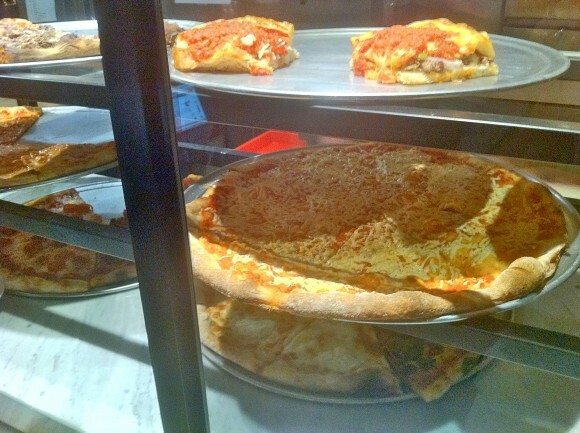 “@msenese: New post on my site: I Review a Slice of Vegan Pizza http://t.co/UDdaaQUy attn @pizzanista @quarrygirl” stoked mike thank you!! !